The leadership team at FACTA (Florida Assocation of College Test Center Administrators) has worked many hours in close collaboration with McCann Associates to produce the first in a series of professional assessments for test center staff. The first assessment is designed to validate that entry level testing center staff have a strong understanding of the policies, procedures, and skills necessary to perform optimally. 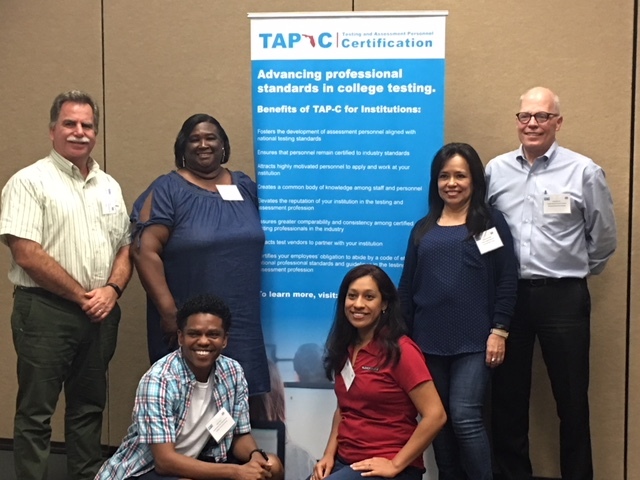 The Testing and Assessment Personnel Certification (TAP-C) benefits a number of constituents: proctors, examiners, and assessment managers/directors. The certification also provides recognition, competency, and a commitment in the testing and assessment profession. The program is being field tested at select FACTA member schools and fine tuning is under way. The Level 1 assessment should be ready to be released nationwide by the end of 2018. The cost of TAP-C is $75 for Level 1 with subsequent levels to follow. The Assessment is to be conducted at a NCTA Registered Center under the supervision of the Test Center Manager. The Working Group will release a reading list and Reference Guide shortly, if you are interested join the TAP-C mailing list.